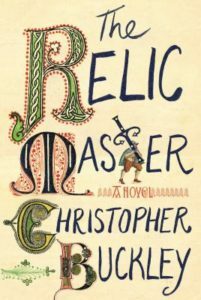 Political writer Christopher Buckley retreats to the 16th century for this hilarious story as he believed the U.S election of 2016 was sufficiently self-satirizing to demand his attention. In 1517, relic hunting was a good business for Dismas until he conspires with the artist Durer to produce a creditable shroud for sale to an affluent but corrupt noble. The noble was greatly displeased when the fraud was uncovered and Dismas escapes with his life only after agreeing to steal the true shroud for the noble. The reader then journeys with Dismas and Durer to Chambery in hopes of substituting a shroud of equal or better quality (according to Durer) for the true shroud. Many misadventures and missteps occur for the reader to enjoy until the pair of travelers are rewarded for their efforts. The reader should then read again the 2017 news report at the beginning of The Relic Master to see what the author is suggesting. John Nichols is on a road trip from Chicago to South Carolina to attend his oldest daughter Karen’s wedding. Accompanying him is his nineteen-year-old son, Ethan, who has autism. Travelling with Ethan is so difficult that John feels they can only drive several hours each day. In fact, living with Ethan has put a strain on everyone in the family, and John and his wife, Mary, divorced after he had an affair. John also has a secret agenda for this trip: a spot has opened up at a group home in Maine for Ethan to live full time. Mary and John agreed a while ago that the place is perfect for Ethan. They just didn’t expect an opening so soon. How will the family let Ethan go after he has been such a huge part of their lives for so many years? In It’s. Nice. 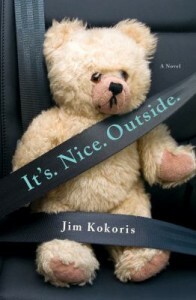 Outside., Jim Kokoris has written a realistic, at times humorous, look at how each member of a family is affected by living with a special needs child. Something snapped in Bernadette a long time ago. No one knows for sure. She quit her job at the peak of her architectural career. She had several miscarriages. 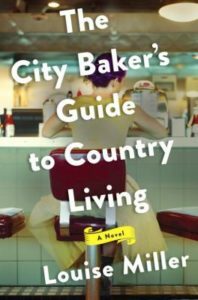 Now she is a recluse who tries to hold it together for the sake of her brilliant daughter Bee. She thinks she has found the answer with the help of a virtual assistant, but everything goes wrong when the family is about to embark on a trip to Antarctica. 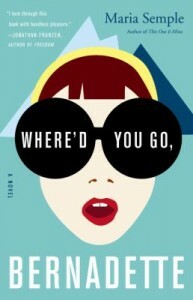 Check out Maria Semple’s Where’d You Go, Bernadette along with other stories told through letters, emails, diaries, etc. 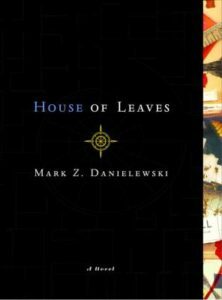 in our list of Epistolary Novels. Parks and Recreation star Aziz Ansari is a standup comic who made jokes and observations about the state of dating in the digital era during his Modern Love tour last year. Building on those observations, Ansari teamed up with New York University sociology professor Eric Kleinberg to write a book on romance, texting, dating, and more with lots of facts, charts, and jokes. Modern Romance is a fascinating and entertaining look at not only the dating culture in America, but in Brazil, Japan, France, and Qatar. I listened to the audiobook, read by Ansari himself, and I have never had so much fun learning! In the early 1970s, a woman from a wealthy background suddenly finds herself divorced and living in a small English village, where divorced women are suspect (it would seem for good reason). 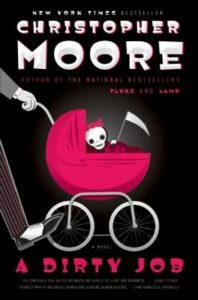 The book is told in the first person by ten-year-old Lizzie (looking back as an adult) and has quite a funny tone and wonderfully set pieces. 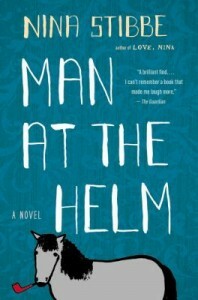 Nina Stibbe’s Man at the Helm is very funny, but sad too. Delight in to this amusing short book of poems from a cat’s point of view. 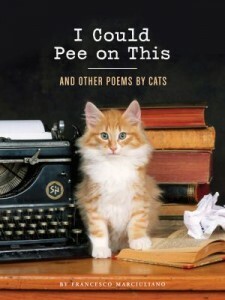 The poems in I Could Pee on This really capture a cat’s quirky personality and behavior. Cute photos enhance enjoyment of Francesco Marciuliano’s book. 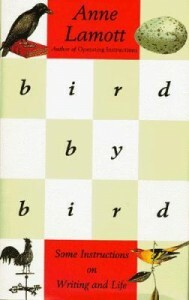 Bird by Bird is Anne Lamott’s book on writing. 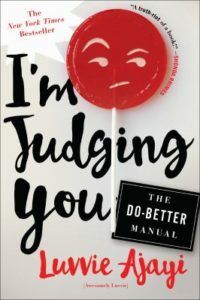 She covers a wide variety on life and writing including chapters called “Sh**ty First Drafts,” “Jealousy,” and “Writer’s Block.” She begins with a simple example from 30 years ago of her then 10-year-old brother struggling with a report on birds that was due the next day. He didn’t have any idea on how to even begin. Their father came to comfort him and said that he all he needed to do to complete the report was to take it “bird by bird.” It is a simple and touching beginning that summarizes the entire book. This book is inspiring and hopeful to all writers and artists who are struggling to complete their writing goals. 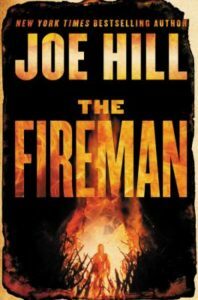 I recommend it to anyone who likes to create.